This semester, three Bauer College students were recognized with special leadership awards for their success as leaders in student organizations and within the college. 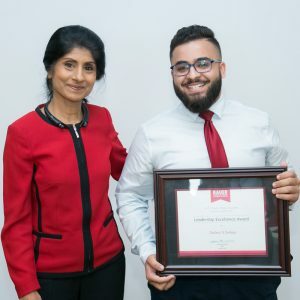 During an end-of-year ceremony, management information systems senior Nabeel Chohan received the Leadership Excellence Award, supply chain management junior Maria Guerrero won the Presidential Excellence Award, and management information systems junior Hilario Yanez earned the Ted Bauer Leadership Award. 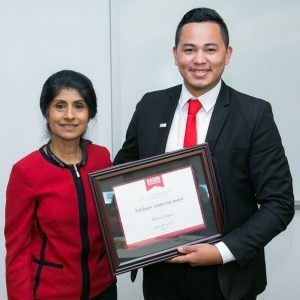 Nabeel Chohan is the recipient of the Leadership Excellence Award for his role in the MIS Student Organization as the JAVA Education Officer. In this role, Chohan is responsible for helping students “survive” what is arguably the most challenging course within the MIS degree plan – JAVA. Maria Guerrero serves as the president of the Bauer Women Society. Through her enthusiasm and passion for giving back, Guerrero has transformed the Bauer Women Society. 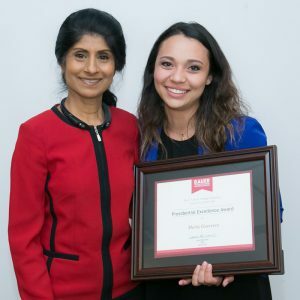 With that attitude and through the support of her cohesive officer team, she was able to accomplish many longstanding goals of the organization — from building a stronger partnership with the Greater Houston Women’s Chamber of Commerce, to hosting an event featuring Bauer College Dean Latha Ramchand. Hilario “Eli” Yanez currently serves as president of MISSO and has also previously served as its corporate relations officer. Yanez has a long list of personal accomplishments, including four internships with various Fortune 500 companies and a full-time offer from Accenture. He also was included in a New York Times article about DREAMers.